When we travel, we travel hard. We maximize our time even if it means more time in the car and barely stopping for breaks. Seeing the world is our passion. The more we see the better. Sage was dropped into this lifestyle at birth and she rolls with it well. But don’t be fooled to think we have a laid back kid, actually quite the opposite. She is just like her parents. Strong willed, active, and opinionated. If you read our posts and think to yourself- “Our kid could never handle this stuff…you know how fill-in-the-blank he is!” Think again. I promise it’s more about regulating your own emotions and expectations than it is about your child. 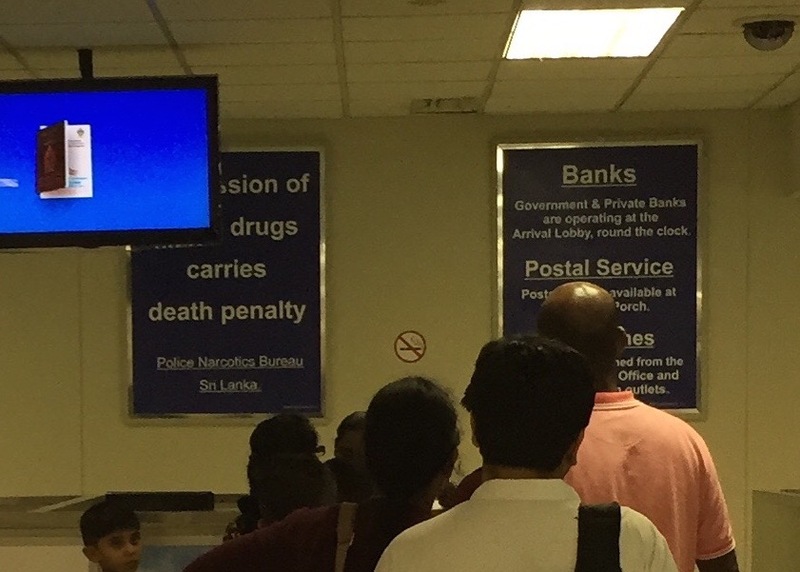 We arrived in Sri Lanka at 8:00pm and found the “possession of illegal drugs carries death peanalty” sign an amusing welcome. I wondered… if someone were smuggling drugs into the country, is it at this point they think- oh jeeze this was a bad idea. I’ll just take the cocaine out of my underwear and hand the goods to the customs agent. Does one still get the death penalty if they turn themselves in? By the time we arrived at the customs desk I forgot to ask. 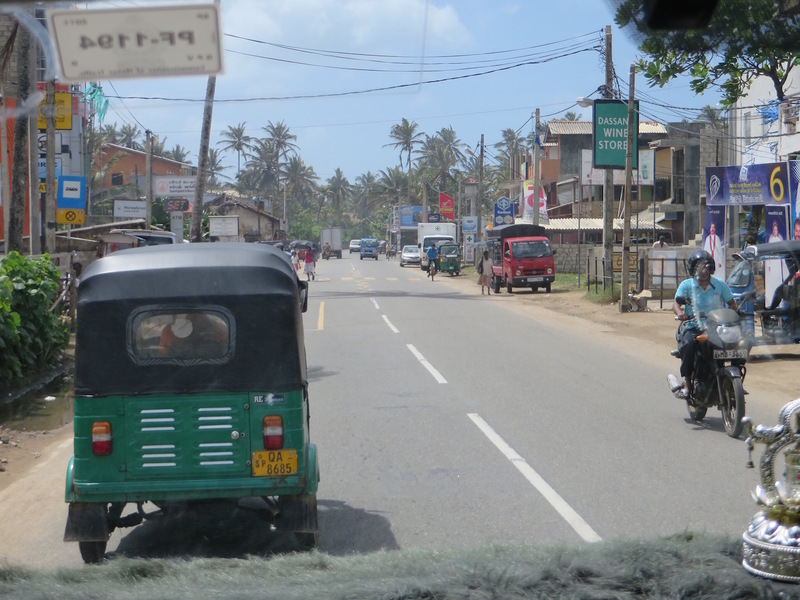 The drive to Unawatuna from the Bandaranaike Airport in Colombo was two hours. Because of how tired we were, it felt like four. My glands were hard and round like ping pong balls which could only mean one thing. Throat infection. I tried to ignore it and relax. Two very long hours later we arrived at the beautiful Thaproban Beach House. It was worth the drive! A hobble to the shower and 30 mins of the shakes later I accepted the throat infection was here to stay. I am notorious for getting sick when we travel so while this wasn’t a surprise, it was a huge disappointment. My husband, being used to this, is brilliant at taking over and taking care of everyone. So thanks to him and some Tylenol PM we were soon fast asleep. The morning sun brought chattering monkeys and beautiful views. The Thaproban Beach House is beautiful. I loved the laid back lattice beach decor and attention to detail. Even the keys added a unique touch. It’s a clean, happy, hotel. Don’t you love this key? 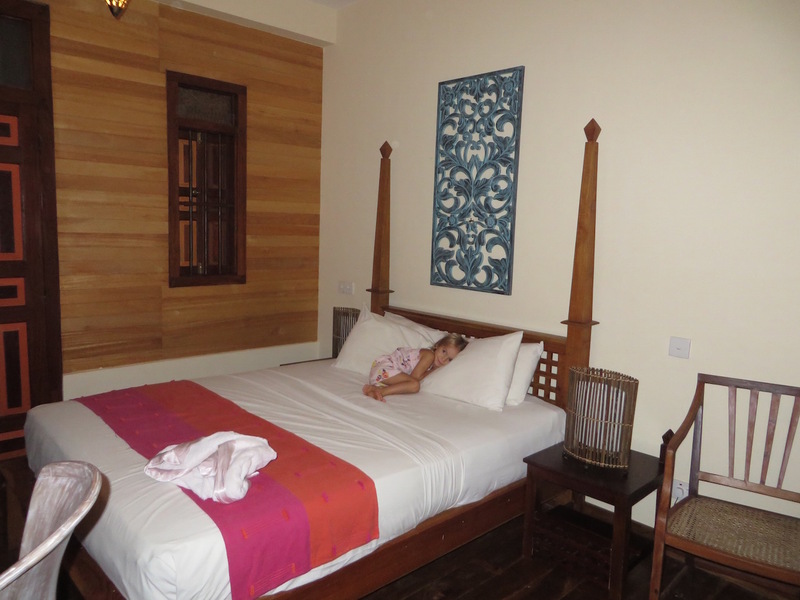 I regret we didn’t have more time to enjoy the beach, Ayurvedic medicine, and yoga classes. Had we stayed put this would have been a beautiful place to fight an infection. The little we saw of this area confirmed that we need to return. Unawatuna is a bohemian spiritual beach-goers paradise. Sri Lankan people are so sweet, especially to children. Sage got about as much attention here as she did in Japan. Someday, when we travel back to the U.S., she’s going to wonder why strangers don’t stop to kiss her head, give her chocolate, touch her face, or try to pick her up! 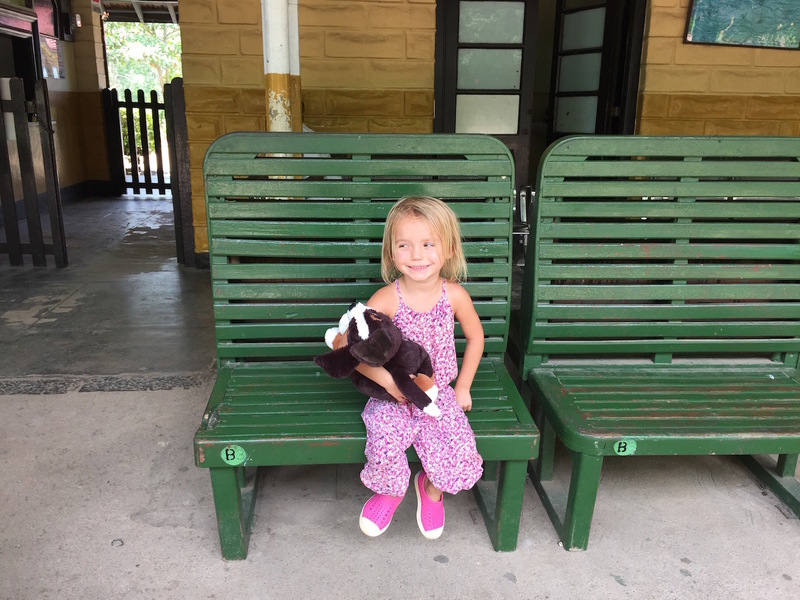 The Sri Lankan friendliness combined with Sage’s outgoing personality got her a job at the front desk. If you know my kid you will know why I was tempted to let her stay for a few days. One of my favorite parts of traveling with our daughter is witnessing how she views difference. She is never negative or judgemental. Instead she celebrates newness with wonder and awe. How beautiful would it be if we all did that? At what point do we learn to be so critical of difference? We found one of our favorite differences on the road. Driving in Sri Lanka is very exciting. Our guide Sam, had the agility of an F1 driver behind the wheel of a minivan. Peter and I learned that on every two laned road there is a hidden third lane. It’s right down the middle! Don’t ask me who gets the right-of-way. It felt like a constant game of chicken. We were also introduced to the Sri Lanka strategy we coined, “The Double Pass.” Sam was pulling onto the middle lane about to pass the car in front of us. A different car came up from behind us, drove into oncoming traffic, passed our car AND the car in front of us. We loved it. Events like this, along with the constant challenge of avoiding peacocks, cows, dogs, tuk tuks, and pedestrians confirmed that you don’t have to visit a race track for exciting driving. Sri Lanka has got you covered. Roadsides are equally entertaining. We found a fried rice stand, breakfast burritos, an elephant in a truck, a coconut stand, a dancing monkey, shrines, waterfalls, a python, vegetables, and a cobra. Not vegas and not the zoo. Just everyday travel in Sri Lanka. I would love to make a coffee table book of all the unique things we hear when traveling. My favorite Sam quote came when driving through a busy city. As we approached a bridge Sam casually said, “crocodile territory on the left. There’s a crazy crocodile in there who has killed 17 people.” Before I could shake the sleep from my ears to see if I understood him correctly, he was effortlessly on to the next thing. Sri Lanka filled me with so much happiness I thought it might come pouring out of me like some wonderful version of the stomach flu. Nothing gets me higher than new international experiences. AND FOOD. I love to eat and Sri Lanka has amazing food. 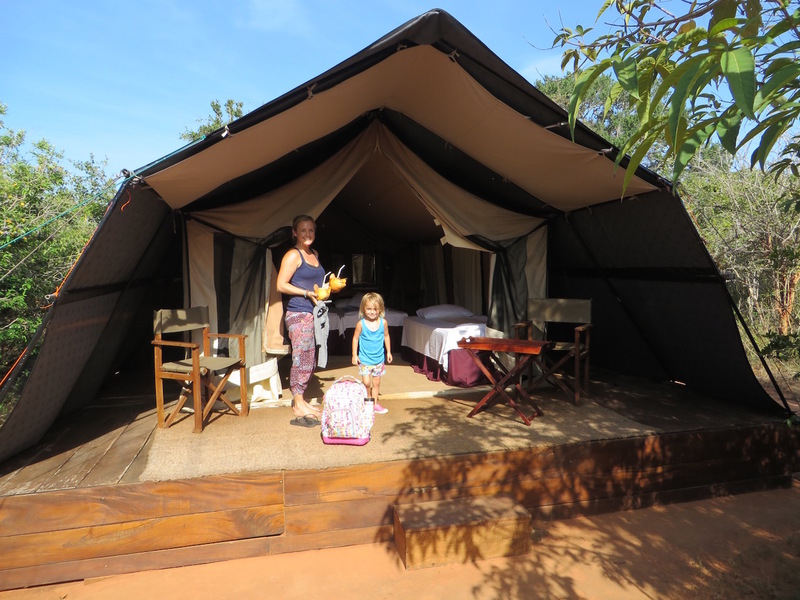 Our overnight at the Ruhunu Safari Camping was our first ever experience “glamping” and wow… we have been missing out. Someone please remind me why we continue to rough it! A cozy full sized bed in nature? With a private tented shower? Totally isolated from the rest of the world? Yes please! This camp was especially memorable because of the incredible cooking of Sarath, the chef. We tried coconut roti, egg plant curry. pumpkin curry, boiled vegetables, bbq Chicken, dhal curry, and coconut sambol. My throat hurt so badly I could barely swallow my food but this didn’t stop me from fully appreciating the flavorful and passionate meal. My love for food parallels my love for travel. Spicy, exciting, and a little bit uncomfortable. 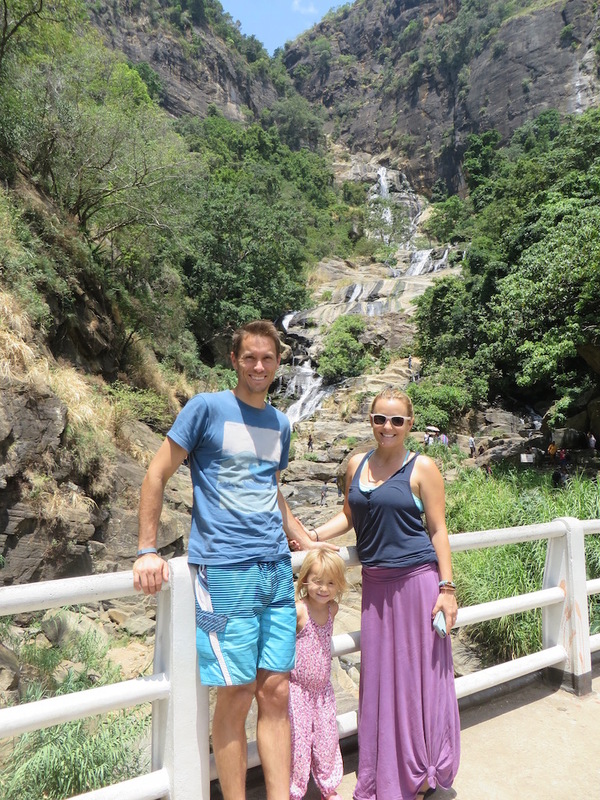 By the time we arrived in Nuwara Eliya my throat was on fire. WebMD served as my mobile primary care physician and I wrote myself a prescription for cephalexin. Sam and I walked into the pharmacy and purchased 10 days worth of antibiotics for $4. One more reason I love foreign travel. You need antibiotics, you get antibiotics. Easy peasy. Within 48 hours I was back to myself. If I haven’t made it clear already, Sri Lanka is worth a visit. Even if you have to take a trip around the world to get there. Do a yoga retreat, a safari, surf, mountain bike, tea taste, snorkel, dive, hike, rock climb. Do it! And make sure you email Sam first. He has all the hook-ups! This entry was posted in Asia, Sri Lanka and tagged adventure travel, cobra, Colombo, crocodile, King Coconut, monkey, Nuwara Eliya, Ruhunu Safari Camping, Sri Lanka, Thaproban Beach House, travel with kids, Unawatuna, Yala National park. Bookmark the permalink. I love this post, Elizabeth! The humorous tone is great. I can’t wait to see a post about your time in Nepal! Did you end up figuring out how to follow my blog? I got a notification that you subscribed, but I want to make sure that the subscription function is easy to find and user-friendly. So cool!! And your daughter is the cutest thing! She’s so brave and I agree that everyone should address unfamiliar sights without judgement but rather curiosity. 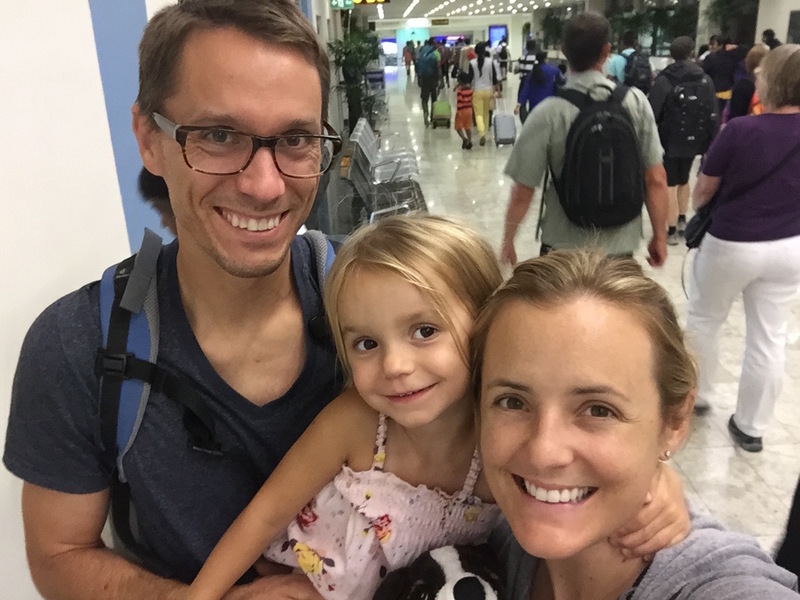 I love seeing that side of the world through your travels … Looking forward to your next adventure! 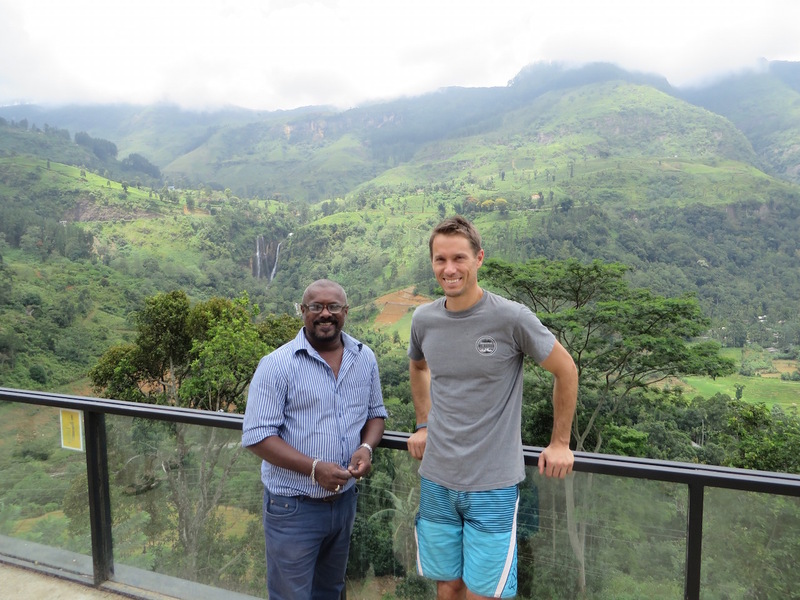 L’anno scorso sono andato con mio figlio per un bellissimo tour in SriLanka con Sam Tours che oltre ad essere un ottimo driver è altresi una bravissima guida turistica ben preparato a raccontare le storie dei posti che visitavamo. Abbiamo visto foreste meravigliose con cascate dove abbiamo perfino nuotato in mezzo una natura ancora totalmente incontaminata. Visto la giungla di Yala con tanti elefanti che incontrevamo lungo il percorso. Piantagioni del famoso tè dove da generazioni lavorano donne Tamil che si occupano della raccolta. Templi hindu e buddisti nascosti e lontani dal mondo civilizzato. Grazie Sam per averci guidato in questo paradiso! It feels like I’m right there with you. Well, I am in spirit! Hugs all around, including Jules.